Why is a Coercive Control Framework So Important? We are excited to share this important legal resource, created by recent Vanderbilt Law School graduate Alexandra Michelle Ortiz. Invisible Bars: Adapting the Crime of False Imprisonment to Better Address Coercive Control and Domestic Violence in Tennessee was published in Vanderbilt Law Review and outlines a proposed adaptation to the preexisting law of false imprisonment to create a comprehensive coercive control statute in the United States. The Note examines what advocates can learn from the UK Law and why the United States Constitution requires American advocates take a different approach. On average, three or more women are murdered by their intimate partners in the United States every day. Despite the now well-known correlation between coercive control—the strategic use of oppressive behavior to control primarily female partners—and intimate partner homicide, most states continue to focus their criminal domestic violence laws solely on physical violence. As a result, state laws often fail to protect victims from future and escalating violence. Focusing on Tennessee law and drawing from the work of Evan Stark as well as the United Kingdom’s Serious Crime Act of 2015, this Note proposes adapting the preexisting crime of false imprisonment to create the first comprehensive criminal coercive control statute in the United States. This is an important resource for anyone interested in exploring possible legal remedies to better protect victims of coercive control in the United States. While it focuses primarily on coercive control in intimate relationships, it is a helpful place to start that could also impact victims of coercive control in other types of relationships (gangs, human trafficking, political and religious cults, etc.). 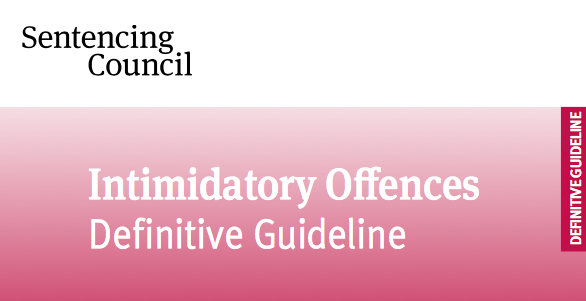 Two weeks ago, the UK released sentencing guidelines for "intimidatory offenses" including those convicted under the 2015 law criminalizing controlling or coercive behavior in an intimate or family relationship. The press release announcing the new guidelines indicates they were created after a public consultation and intended to "provide judges and magistrates in England and Wales with consistent and comprehensive guidance when sentencing these related offences." The guidelines provide direction on analyzing the seriousness of the offense committed and consideration for aggravating factors. In 2011, Sally Challen was sentenced to 22 years in prison for the murder of her husband, Richard. Her case has drawn a lot of attention in the United Kingdom over the past few weeks because she was recently granted the right to appeal the court's decision. Why? Challen's lawyers claim there is new evidence that suggests Sally's husband was abusive to her, and under the 2015 law outlawing coercive and controlling behavior, her lawyers are arguing that she was the victim in the case and Richard's death was an act of self-protection. This particular case is important to watch for many, including those interested in how implementation of a coercive control law could play out in the U.S., but even more importantly for victims in the U.K., as the reality of living under a regime of coercive control and the lasting damage it causes is now receiving national attention. "Sally Challen’s case has the potential to change, if not the world, where men will surely continue to abuse women until what it means to be a man changes completely, then the way we look at the world, and in turn, the women suffering inside it. This case has comprehensively laid out the ways in which women are crushed by their abusers. It’s shown the depth of violence women suffer in these relationships, the lack of control they have, whether of their bank accounts or how regularly they’re allowed to go to the toilet, and so in turn, explains how difficult it can be to leave this house, this double-glazed prison. "We know the role that children play in these stories, we’ve seen how mothers will put themselves at risk to protect them. If Sally’s appeal is successful, as her son David (who has been campaigning steadily for her release, calmly answering questions about his father’s death on Good Morning, and calling for mental abuse to be taken more seriously in this country) is hoping, then thousands of women living in similar small hells, could be freed too." We highlighted the 2015 UK law criminalizing "coercive, controlling" behavior last week. Thankfully, because legal documents pertaining to the law are all in English (as opposed to the law in France), we have been able to access some of the information that's been utilized to assist victims, direct service providers, police officers, hospital staff and legal professionals navigate cases where coercive control may be utilized by an abuser. We have found the legal guidance, as well as the guidelines for police investigation, to have very useful and practical information as to how the coercive control pattern is translated into tangible pieces to use as evidence in an investigation. Additionally, those tangible parts (text messages, bank statements, etc.) may be practices or investigative methods that could be utilized to strengthen current policies and practices in the United States, regardless of the lack of a law that explicitly criminalizes coercive control. Below are guidelines created by the College of Policing to teach officers how to investigate domestic violence cases with the new law in place, encouraging officers to "focus on identifying a pattern of behaviour across different types of evidence. Much of it will be evidence of the victim and perpetrator’s day to day living and their interaction." The guidelines indicate this list is not exhaustive and any evidence which shows a pattern of control or coercion is relevant and to be recorded. See Home Office (2015) Statutory Guidance Framework and Crown Prosecution Service (2015) Controlling or Coercive Behaviour in an Intimate or Family Relationship for further information. Any of this activity that came before the law was enacted (December 29th, 2015) may not be used as evidence, but some forms of it may be able to be used as evidence of “bad character evidence” as explained here. Hopefully, you found this information helpful. There are several resource available online that provide direction for those wanting to understand how the UK law is being implemented, some of which we have made available on our Take Action page. If you have any resources you'd like to share with us, please feel free to leave any in the comments. One of the primary goals of this website is to advocate for policy change in the United States that recognizes the harms of coercive control. Currently, only physical violence against a victim is recognized as a crime, meaning that until bodily harm or injury occurs, victims have no legal protection. In fact, Dr. Evan Stark, whose book Coercive Control introduced the concept, argued "the primary outcome of coercive control is a condition of entrapment that can be hostage-like in the harms it inflicts on dignity, liberty, autonomy and personhood as well as to physical and psychological integrity." In short, Stark argued coercive control represents a human rights violation and a "liberty crime" against the victim. Other countries have created laws intended to protect victims from not just the physical harm they may (or may not) experience, but the emotional and psychological patterns of abuse utilized by many abusers. A January 2018 article in the Huffington Post provides an overview of places where psychological abuse is outlawed. We think of psychological abuse as a prime tactic used in any coercive control pattern and are excited to see how laws meant to address this form of abuse are utilized in court systems. While there may be limitations to a bill that explicitly addresses coercive control, the implementation of these laws may be very informative as we work to strengthen current policy here in the United States. Below, we have included an introduction to relevant legislation in both France and the United Kingdom. We will continue to review the framework, implementation and analyses of these laws, which we hope to share with you in the near future. In opposition, Sandra Horley, the chief executive of Refuge, said she did not believe that criminalizing coercive control was the right solution. “We already have enough laws – the problem is that they are not being implemented properly,” she said. “The police don’t even arrest when there is evidence of serious physical violence, so how are police and juries ever going to understand complex concepts like coercive control? The implementation of these laws are an exciting development and represent an opportunity for advocates in the United States to learn how to be most effective in meeting victim's needs and best practices for direct service providers, police officers, hospital staff and legal professionals.